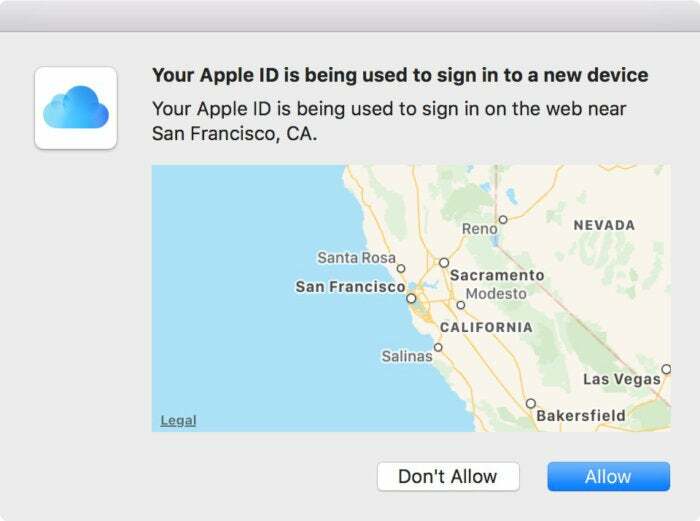 The first step in Apple’s 2FA is a location alert that appears on every computer and iOS you own logged into the same Apple ID account. The notion is that you should validate that the location is correct before you proceed to get the code. Clicking Don’t Allow terminates the login attempt. For Erich, however, he’s seeing a login attempt from Monroe, Louisiana, which he found confusing. He gets this alert when he is trying to log in at iCloud.com, and wondered if it were legitimate. Because Apple doesn’t explain when you log in that it’s going to alert you on all your connected devices, this can seem counter-intuitive when you’re using a browser—because the device from which you’re logging in tells you there’s a login attempt. If you’re using a VPN (virtual private network), you may be told that you’re logging in from far away as well! Keep that in mind if you’re worried about someone intercepting your connection—the far end of your session, where Apple “sees” you connecting to the Internet, is almost always going to be one of the data centers at which the VPN service has its servers located. I wrote earlier about whether it’s a good idea to allow you to confirm your identity from the same machine you’re trying to log in from.